“The wicked band together against the righteous and condemn the innocent to death” (Psalm 94:21). Planned Parenthood, the nation’s largest provider of abortion, and the Democratic Party have joined hands in a new, strategic unity to fight against the unborn. Gone is the decade’s old mantra of making abortion “safe, legal and rare.” Today, there’s a new strategy of appreciation, celebration and even forced participation. The Democrats welcomed Cecile Richards, director of Planned Parenthood, to their convention to unveil this new way forward as she used the term “abortion” three times in her speech. There’s no more conveniently dodging the word anymore – it’s being warmly embraced by the party. First, she shed the label, “pro-choice,” for more appealing labels like “reproductive rights” and “women’s health care.” We’ve seen the Democrats and Planned Parenthood use these terms before, but now the strategy is clear: Out with choice, in with reproductive rights and health care. But what hypocrisy?! “Women’s health care” – seriously? When a Texas law was passed that called for abortion clinics to meet minimal health and safety standards – the same standards even veterinary clinics meet – Planned Parenthood vehemently opposed it. The “health-care” label is nothing more than a shrewd cover-up for dismembering innocent children in any unhealthy or unsafe facility that will perform the procedure. And what about unborn women? Do they have “rights”? Should they receive “women’s health care”? They, too, have all the organs in place that will allow them to reproduce, so what about their “reproductive rights”? Maybe Cecile will eventually convince Democrats to push for harvesting unborn reproductive organs as well. She’s already harvesting kidneys, livers and lungs. But the fight doesn’t stop here. With new terms in place, the Democrats and Planned Parenthood will seek to repeal both the Hyde and Helms Amendments. These laws restrict taxpayer-funded abortions domestically and internationally. This accusation against our country is exactly what she intends to do – force participation in the push for abortion through taxpayer-funded care. And don’t miss the use of words here – care is not really care, but a choice to dismember an unwanted child. So in today’s Democratic Party, not only do they demand appreciation and celebration for abortion, but now they seek to force participation in it. Planned Parenthood simply helps to provide the muscle. Next is the concealed rage that is clearly evident behind the veil. After being exposed for harvesting baby parts on the black market, Cecile Richards and Planned Parenthood not only dodged the punches but swung back with a fury. “Therefore rejoice, you heavens and you who dwell in them! But woe to the earth and the sea, because the devil has gone down to you! He is filled with fury, because he knows that his time is short” (Revelation 12:12). Cecile Richards, Planned Parenthood and now even the Democratic Party have no clue that the fury of Satan rages through their policies on abortion. Because he comes to “rob, kill, and destroy” – and he does it through people willing to give him access. They have simply become willing dupes in his hand. But there’s always hope, as long as there is breath. Turning back to God can change everything. This is our prayer for Cecile, Planned Parenthood and the Democratic Party. “Open your mouth for the mute, for the rights of all the unfortunate. 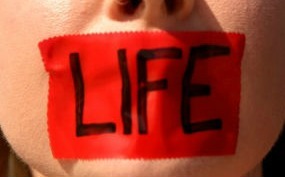 Open your mouth, judge righteously, and defend the rights of the afflicted and needy” (Proverbs 31:8-9).